We weren’t going to announce/begin the competition until January 15th, but some of you beat us to the punch by finding the webpage! We love how eager everyone is to get started, so we’ve decided to go ahead and publish it. The official announcement will be released in the January issue of Harrisburg Magazine, which will be on the shelves by January 15th. You may have noticed some changes this year. The biggest change is the “nomination period” which runs (officially) from January 15 until March 15, 2018. 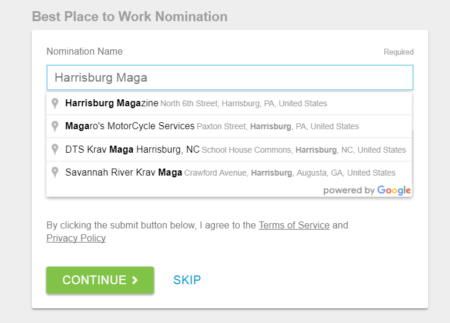 During this period, you can go online and nominate who you’d like to see on the ballot. 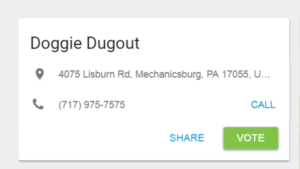 As you enter your names, you should notice several choices “pop up” because our new platform integrates with Google. This helps us better identify who you are nominating. If you don’t see your choice (which you won’t for events, people or creative work) you can still enter the information in. You must register in order to vote, but you only need to register once. One of the biggest benefits of this new voting platform is that we will have a more focused voting ballot where only the top 5 to 10 nominees in each category listed. During this voting process, you will see the name and address of any businesses (and possibly additional information) for each nominee. This will give you a chance to explore all the nominees (should you so desire) during the voting period. Who knows? Perhaps you might find a new favorite! Nominations have begun!! Voting begins April 15!! To go to the ballot, click here. Is there going to be a special “weddings of 2017” edition. If so, when will it be published? Will a special edition of 2017 weddings be published?